HER2 mutations have been identified as another oncogenic driver in the growing list of actionable targets in non–small cell lung cancer (NSCLC). Based on a mounting body of evidence on the impact of HER2 mutations in lung cancer and the growing focus on personalized medicine, the HER2 receptor has gained focus as a potential target for precision medicine treatments for patients with NSCLC. Human epidermal growth factor receptor 2 (HER2; ERBB2) is a member of the tyrosine kinase receptor family, which also includes HER1, HER3, and HER4.1 The overexpression of HER2 has been shown to result in oncogenic cell proliferation and transformation in humans. Additional data suggest that tumor models and patients expressing HER2 mutations tend to be insensitive to EGFR tyrosine kinase inhibitors (TKIs),5 suggesting the need for specific HER2-directed therapies for these patients. Trastuzumab (Herceptin) is a recombinant humanized monocolonal antibody directed against the HER2 receptor. In tumor cells that overexpress HER2, trastuzumab binds to the membrane HER2 on the tumor cell and induces antibody-dependent cell-mediated cytotoxicity.6 In patients with HER2-mutant advanced NSCLC, trastuzumab has shown a modest benefit in 2 retrospective analyses in previously treated patients with HER2-mutant advanced NSCLC.7,8 In a 2013 study, among 3800 patients with NSCLC tested for HER2 mutations, alterations were identified in 65 patients (1.7%). In 16 of those patients, HER2-targeted treatments were administered after conventional chemotherapy. With trastuzumab-based therapies (n = 15), a 96% disease control rate was observed.7 In a study conducted in 2016, within a cohort of 101 patients from European Union centers, 65 were identified as having received HER2-targeted therapies following conventional treatment and demonstrated an objective response rate (ORR) of 50.9%.8 Of those patients, 57 received trastuzumab-based therapy. In the study, trastuzumab was given concomitantly with chemotherapy, and the investigators concluded that when given in combination with chemotherapy, trastuzumab may contribute to better results. Trastuzumab combination therapies and conjugates are also being explored in several phase II studies. One such study, an open-label phase II study, explored the safety and efficacy of trastuzumab in combination with paclitaxel chemotherapy.9 The study met the primary endpoint of tumor response according to RECIST criteria and the ORR was 46% across the study. Furthermore, postprogression tumor biopsies showed an absence of HER2 staining in a majority of study patients, indicating that targeting HER2 with a combination of trastuzumab/paclitaxel is a potentially effective treatment strategy. A HER2-targeted antibody–drug conjugate, ado-trastuzumab emtansine (T-DM1; Kadcyla) is being investigated in patients with HER2-mutated lung adenocarcinomas in a phase II basket trial.10 The study demonstrated positive results in a small group of 18 patients, with partial responses observed in 8 patients (44%), including 2 previously untreated patients and 4 who had received prior HER2-targeted therapy. The study authors concluded that further study is necessary to confirm a potential benefit. 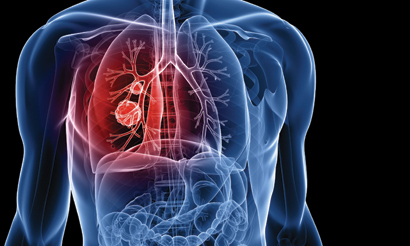 Results of studies of patients with NSCLC on trastuzumab-based therapies suggest a potential benefit of therapy, which requires further exploration. Afatinib (Gilotrif) is an inhibitor of the receptor tyrosine kinase (RTK) EGFR family with antineoplastic activity. It functions by selectively and irreversibly binding to and thereby inhibiting epidermal growth factor receptors 1, 2 (including HER2), and 4, and certain EGFR mutations.6 In recent publications, the modest efficacy and potential implication of afatinib have been demonstrated in case-based and chart review studies. In a case report of a previously treated patient with NSCLC harboring an exon 20 HER2 mutation, off-label use of afatinib therapy was administered. Prior to being treated with afatinib, the patient had failed cytotoxic chemotherapy and treatment with a reversible EGFR inhibitor. One month after therapy initiation, the patient showed rapid radiologic response and remained stable through 4 months of treatment with afatinib.11 In an international multicenter retrospective study, 27 patients with metastatic HER2-mutated NSCLC were treated with afatinib. Treatment with afatinib in this patient cohort resulted in partial responses in 11% of patients.12 The median overall survival was 23 months with afatinib treatment in the study. Further investigation of afatinib in this patient population is warranted. Several promising agents targeting HER2 mutations in patients with NSCLC are also on the horizon. Though data are currently limited, preliminary results suggest a potential benefit. TAK-788 is an investigational TKI that has shown selective activity in preclinical studies against EGFR and HER2 mutations. An initial report from a phase I/II, first-in-human, open-label study (NCT02716116) in 34 patients showed that TAK-788 exhibited antitumor activity with an adverse event profile consistent with that of other EGFR TKIs.13 Partial responses were observed in 3 of 14 evaluable patients, and 6 experienced stable disease. Neratinib (Nerlynx), another RTK inhibitor, is currently approved for use in patients with HER2-positive breast cancer. A small phase II study in 62 patients explored the combined inhibition of HER2 and mTOR in patients with HER2-mutated NSCLC, using a combination of neratinib and temsirolimus (Torisel). Responses were observed in 19% of 43 patients treated with the combination, lasting from 2 to 18-plus months during the study period.15 No responses were observed in patients treated with neratinib alone. Research has shown the value of targeting HER2 mutations in NSCLC with various therapies. Despite the smaller-size studies and limitations, treatments such as trastuzumab, afatinib, and other compounds offer promising therapies for patients with HER2-mutated NSCLC. “In clinical research-based protocols that translate to our practice guidelines, we have graduated from EGFR to small molecule targeting but seemingly have let the story of HER2 go by the side line,” Krishnamurthy added. “HER2 offers a potential target for treatment in lung [cancer] and is being studied. Pillai RN, Behera M, Berry LD, et al. 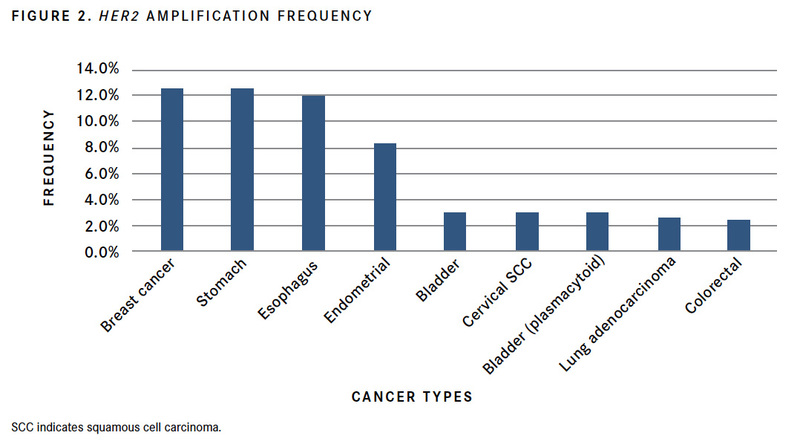 HER2 mutations in lung adenocarcinomas: A report from the Lung Cancer Mutation Consortium. Cancer. 2017;123(21):4099- 4105. doi: 10.1002/cncr.30869. Connell CM, Doherty GJ. 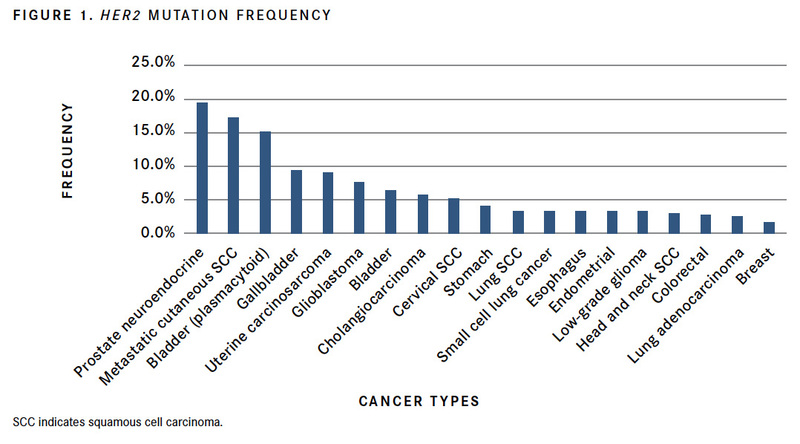 Activating HER2 mutations as emerging targets in multiple solid cancers. ESMO Open. 2017;2(5):e000279. doi: 10.1136/esmoopen- 2017-000279. Stephens P, Hunter C, Bignell G, et al. Lung cancer: intragenic ERBB2 kinase mutations in tumours. Nature. 2004;431(7008):525-526. doi: 10.1038/431525b. Yasuda H, Kobayashi S, Costa DB. EGFR exon 20 insertion mutations in nonsmall- cell lung cancer: preclinical data and clinical implications. Lancet Oncol. 2012;13(1):e23-e31. doi: 10.1016/S1470-2045(11)70129-2. Wang SE, Narasanna A, Perez-Torres M, et al. HER2 kinase domain mutation results in constitutive phosphorylation and activation of HER2 and EGFR and resistance to EGFR tyrosine kinase inhibitors. Cancer Cell. 2006;10(1):25-38. doi: 10.1016/j.ccr.2006.05.023. NCI Drug Dictionary. National Cancer Institute. www.cancer.gov/publications/ dictionaries/cancer-drug/. Accessed August 29, 2018. Mazières J, Barlesi F, Filleron T, et al. Lung cancer patients with HER2 mutations treated with chemotherapy and HER2 -targeted drugs: results from the European EUHER2 cohort. Ann Oncol. 2016;27(2):281-286. doi: 10.1093/annonc/mdv573. Mazières J, Peters S, Lepage B, et al. Lung Cancer That Harbors an HER2 Mutation: Epidemiologic Characteristics and Therapeutic Perspectives. J Clin Oncol. 2013;31(16):1997-2003. doi: 10.1200/JCO.2012.45.6095. De Langen J, Kuiper JL, Thunnissen E, et al. . Trastuzumab and paclitaxel in patients (pts) with EGFR mutated non-small-cell lung cancer (NSCLC) that express HER2 after progression on EGFR TKI treatment. J Clin Oncol. 2017;35(suppl; abstr 9042). meetinglibrary.asco.org/record/145801/abstract. Li BT, Shen R, Buonocore D, et al. Ado-trastuzumab emtansine for patients with HER2-mutant lung cancers: results from a phase II basket trial. J Clin Oncol. 2018;36(24):2532-2537. doi: 10.1200/JCO.2018.77.9777. Park CK, Hur JY, Choi CM, et al. Efficacy of Afatinib in a Previously-Treated Patient with Non-Small Cell Lung Cancer Harboring HER2 Mutation: Case Report. J Korean Med Sci. 2018;33(1):e7. doi: 10.3346/jkms.2018.33.e7. Lai W-CV, Lebas L, Milia J, et al. Afatinib in patients with metastatic HER2-mutant lung cancers: An international multicenter study. J Clin Oncol. 2017;35(suppl 15; abstr 9071). meetinglibrary.asco.org/record/145760/abstract. Doebele RC, Riely GJ, Spira AI, et al. First report of safety, PK, and preliminary antitumor activity of the oral EGFR/HER2 exon 20 inhibitor TAK-788 (AP32788) in non–small cell lung cancer (NSCLC). J Clin Oncol. 2018;36(suppl; abstr 9015). meetinglibrary.asco.org/record/160284/abstract. Kris MG, Camidge DR, Giaccone G, et al. Targeting HER2 aberrations as actionable drivers in lung cancers: phase II trial of the pan-HER tyrosine kinase inhibitor dacomitinib in patients with HER2-mutant or amplified tumors. Ann Oncol. 2015;26(7):1421-1427. doi: 10.1093/annonc/mdv186. Gandhi L, Besse B, Mazieres J, et al. MA04.02 Neratinib ± Temsirolimus in HER2-Mutant Lung Cancers: An International, Randomized Phase II Study. J Thorac Oncol. 2017;12(1):S358-S359. doi: 10.1016/j.jtho.2016.11.398. Are Adjuvant TKIs in High-Risk RCC Ready for Prime Time?